Transfer PDF to DOC (MS Word) format without missing a bit of important data by using Adobe PDF to Word Converter application. It is freeware solution to export unlimited PDF to DOC format. Microsoft Word is the most widely used word processing platform in all over the world, as you would expect from a MS product. It can be used in countries all over the world and can be used on both Windows devices and Apple. However, just because word is so immensely popular does not mean it is the only option. People who have never used anything except word sometimes become confused & frustrated when they receive a file they want to open, only to find out that word cannot open it. This is when it comes in handy to know how to take your document as well as convert to word. Most of the people who are new to using word processing platforms online become confused when they have faced problem opening a word processing file they have received. And the problem is that each different type of word processing platform creates files that are a specific type of file, called a file extension. If you receive a file that word is not set up to recognize, it can’t be opened fortunately, you can easily convert to Doc. We recently discussed many other options for word processing. Even though word is one of the most popular platform, there are several valid reasons that people use the other options. And the two biggest reasons are convenience and money. The reality is that the MS products can be expensive for normal users. Granted, once you have them, they can be used for years, but then can cost a few hundred dollars at the initial purchase. Then, depending on what type of license you buy, you may need to buy the office products again when you upgrade or replace your system. This can get expensive. The other reason people use other types of word processors is due to convenience. If you just started using a new system and it does not have word on it yet, you are likely to start using whatever word processing platform is available on the computer. Once you have started using those other platforms, it is very difficult to justify the expense of the word unless you have been having trouble. Those are a few of the reasons some people are using other word processing platforms, but that does not help you when you receive a simple file from someone who is using one of those platforms that your copy of word does not open easily. That is where you need to know how to use an online powerful converter to export PDF to DOC format. Now don’t worry about the converter software because a helpful conversion software are available in the digital market that effectively solve all the problem of users without any problem. To import PDF to Doc using this application is very easy and reliable, it is not necessary that Adobe Acrobat Reader must be installed on the machine. You can easily achieve the PDF to word conversion by simply launching the software and extracting the PDF file which are required to be converted. The software includes select folder option that allow to switch multiple PDF to DOC files at once. Once you click this option, it will browse the location and enable to extract the complete folder where several PDF files are stored and then instantly convert all of them at once with accurate and complete information. There are no any restrictions involved related to the file size of PDF for perform conversion. You can easily convert the file of large size fearlessly without hesitation using this migration software. For instance, you are having PDF file of 20 GB, then using the application you can instantly convert 20 GB file to word. The software is designed by technical expertise, so it is capable to supports all the versions of Adobe Acrobat Reader. It also workable with all the versions of MS word without any hesitation. 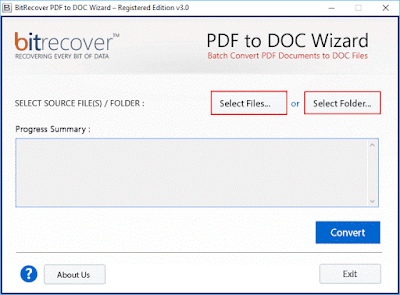 The PDF to word converter is the precise and most popular application among all novice users. The design of the application has been created as per the user’s need, especially according to all those users who are not much familiar with technology. With this app you can easily and simply convert multiple email at once without any issue. This application is capable to convert unlimited Adobe PDF documents to MS Words (DOC, DOCX) format with company watermark that can be remove after upgrade the tool. A lot of users in worldwide are using it’s free version without upgrading because both free and pro editions are same, only company watermark will be add on documents if you use free edition.